Saws perform several functions during fabrication. A block saw, or gang saw cuts the massive stone blocks into slabs. These days, diamond wire saws make short work of this task. A metal wire is studded with industrial-grade or synthetic diamonds, and this wire quickly cuts through stone as hard as granite. A bridge saw is then used to cut the stone slab into the proper shape for its application, whether it be a countertop or a sink. These saws typically use circular metal blades studded with diamonds, and water is sprayed onto the blade to cool it during the cutting process. Modern technology has produced a new type of saw utilizing water jets combined with an abrasive material, which cuts edges and holes quickly and smoothly, and many fabricators are upgrading to these machines. Polishers grind down the naturally rough surface of the stone to whatever finish the consumer desires. Hard stones like marble and granite can be polished all the way to a mirror finish. The polisher consists of rotating pads which are surfaced with an abrasive substance. The finer and smaller the abrasive grits are, the higher the polish. Most modern polishers can produce a variety of finishes, from the smooth, soft look of a honed finish to a slick, shiny mirror finish…even decorative finishes like flamed tumbled or hammered. Routers create edge profiles on a slab, and cut designs on larger pieces like fireplace mantles and hearths. There are dozens of standard edges for countertops and tables, from simple to highly decorative. Routers have a spinning blade covered with diamonds which is water-cooled. It travels along the edge of the slab to shape it. In the past, these machines were either operated by hand, or had some limited automatic function. The time needed to create a finished countertop was significant. A countertop with a complex edge profile might take three weeks or longer. With the introduction of CNC technology, however, that time has been dramatically decreased. CNC, or computer numeric control, utilizes digital technology to precisely control all three types of fabrication machines: saws, polishers, and routers. CNC has cut production time down to a single afternoon for a countertop, even with a very complex edge. CNC also makes the shaping of intricately-designed pieces like stone fireplaces fast and simple. What would normally take a sculptor many weeks to carve may now take as little as a few hours. Today, a countertop begins its journey through the CNC fabrication process in the home, where a wooden or plastic template is cut from the existing countertop to ensure that the new countertop is a perfect fit. In the fabrication shop, the template is placed on a digitizing table, where its exact dimensions are recorded and exported to a Computer Assisted Design (CAD) program. The designer's modifications to the countertop (if any) can now be made, as well as the specification of the desired edge profile, and the location of holes for sinks, faucets, and cooktops. Then the action begins. A massive stone block is placed on the block or gang saw, and the computer tells the saw how thick to cut the slab. 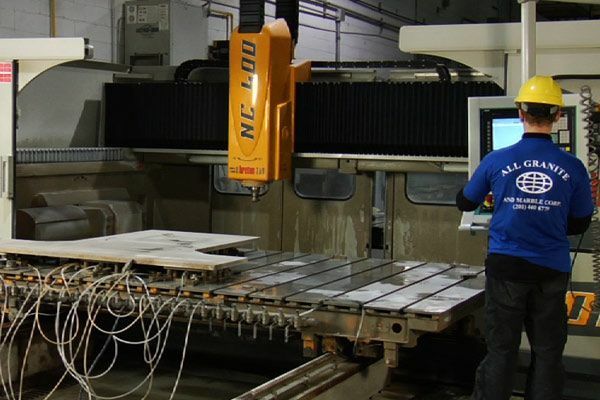 Once the slab is cut, it is picked up by computerized arms and moved to the CNC machine. Here, a series of bridge saws (or water jets) and routers cut the slab to the correct dimensions, cut appropriate holes, and shape the edges. The computer controls every aspect of the shaping process, and the operator doesn't even have to remain at the machine for the entire duration. The countertop is then moved to the polishing machine, where polishing pads grind the surface of the slab to the desired finish. Some machines have laser eyes which ensure that the finish is perfect and even across the entire countertop. Edge polishing machines are then used to finish the edge profiles. CNC has doubled (or more) the productivity of most fabrication shops that have acquired it. It has contributed significantly to the reduction in the cost of natural stone countertops, tables, sinks, tiles, and fireplaces, and will continue to bring these costs down. It has dramatically increased the quality of the finished product. And the best news of all is that it will only get better!